Not only does this island paradise deliver the most beautiful views, you’ll find an incredible assortment of Bora Bora restaurants. Each resort has a great selection of restaurants, true, but there are so many local eateries waiting to be savored! The variety of options range from high-end fine dining to casual burgers and pizzas–catering to a number of budgets and appetites. 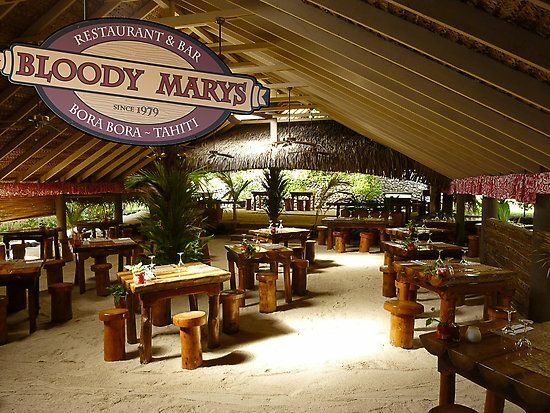 Very much a Bora Bora tourist institution, Bloody Mary’s is known the world around for its island-casual ambiance of white sand floors, thatched roof, and coconut stools. The menu includes freshly caught seafood, steak, crab, as well as vegetarian options. Bloody Mary’s is a fun experience not to be missed! This seven table restaurant is the precious and treasured gem of Bora Bora dining. Owner, Chef Damien Rinaldi Dovio, creates exquisite French inspired/Polynesian infused cuisine served in the intimacy of a Tuscan-like villa. An expensive night out no doubt, but we promise it is well worth the splurge! Reservations are a must as Villa Mahana is often booked months in advance. Maikai is elegantly hip; combining delectable cuisine with a relaxed and modern ambiance. A favorite of Bora Bora locals and visitors alike, Maikai is brimming with trendy vibes from its happy hour menus, vegetarian options, late night eats, and nightly live music. This new restaurant is the younger sister to the renowned La Villa Mahana and features decadent creations by chef and restaurateur, Damien Rinaldi-Dovio. Open for lunch only, this restaurant is perched above the lagoon offering stunning views in an ultra posh and modern environment. The fixed menu is served in a quaint and intimate family style tradition. Home at the InterContinental Bora Bora Resort and Thalasso Spa, Le Corail is romantic, intimate, and modernly chic. Enjoy fine French cuisine while overlooking an under-lit lagoon. And, with the largest wine cellar in French Polynesia, it’s the perfect location for an extra special occasion. Situated with the best sunset views over the lagoon, this is the perfect location for early evening cocktails. The food is casual and eclectic ranging from burgers and salads to dishes that celebrate authentic Polynesian flavors of fresh seafood, vanilla, curry, coconut, and honey. Le St James offers a sophisticated experience of amazing service, and artistic cuisine creations displayed against a backdrop of some of the best views of the bay. The menu is distinctly French, with many reverential nods to Tahitian flavors. A superb choice for a romantic dinner, a delectable dessert, or simply enjoying a cocktail while watching the perfect sunset. This delightful, family run eatery is located at Matira Point. A more casual and hip vibe, The Lucky House is a great choice for a lunch or dinner of local flavors, seafood, cocktails, burgers and around thirty different types of pizza. An easy stroll along the beach from the InterContinental Le Moana, Le Matira is known for its exquisite sushi and New Zealand beef. They also serve casual snack fare for lunch. This is the St. Regis Bora Bora’s award-winning, exclusive signature restaurant. Prepare yourself for an amazing experience of French and Asian-infused cuisine served against the eloquent backdrop of Mt. Otemanu and crystal lagoon waters. Reservations recommended. *Ask your Tahiti Specialist about the special, pre-paid dinner packages available for these restaurants.